Many cake recipes instruct the baker to use “room temperature” eggs and dairy. But, does it really matter if all your ingredients are at room temperature before you begin baking? At room temperature, when you beat eggs and dairy with an electric mixer, they form an emulsion that traps air. This is a good thing because all that trapped air expands in the oven, producing a fluffy consistency. Without this process, bake goods would end up flat, tough, overly dense, and even hard. That’s not to say that beating cold butter and eggs won’t trap some air. But it won’t trap enough for light, fluffy cakes and tender cookies. If you’ve ever baked a cake that came out of the oven kind of flat and super dense, this might be the culprit. So, when a recipe calls for room temperature ingredients, pay attention. It really does matter. 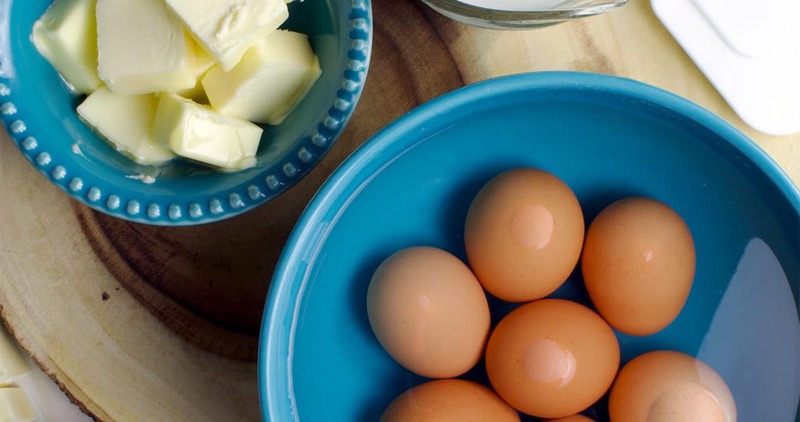 Here’s how to bring Eggs and Dairy to room temperature quickly. 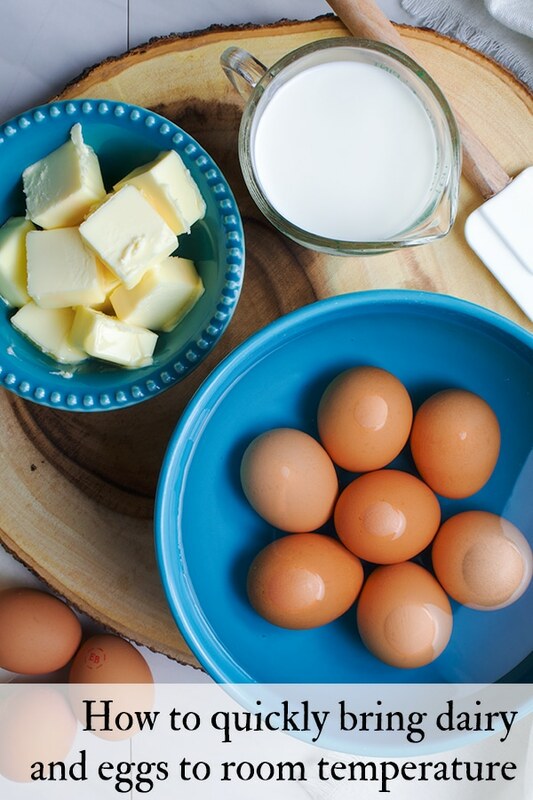 The easiest way to bring eggs to room temperature is to just leave them out on the counter for a couple of hours. While many sources say that it’s safe to leave eggs out of the refrigerator for up to 8 hours, 2 hours is enough to bring them to room temperature and on the conservative side of the safety question. When it comes to food safety, I generally prefer safe to sorry, so two hours is the longest I’ve ever let my eggs sit outside of the refrigerator. But, what if you don’t want to wait two hours to bake that cake? I don’t blame you one bit. No worries. Simply put the eggs in a bowl and fill the bowl with very warm water. How warm? About the temperature you’d want if you were the one taking a bath. Warmer then room temperature, but not so hot the water will scald you. Leave the eggs in the water for about 10 minutes, and you should be good to go. How to bring butter to room temperature. 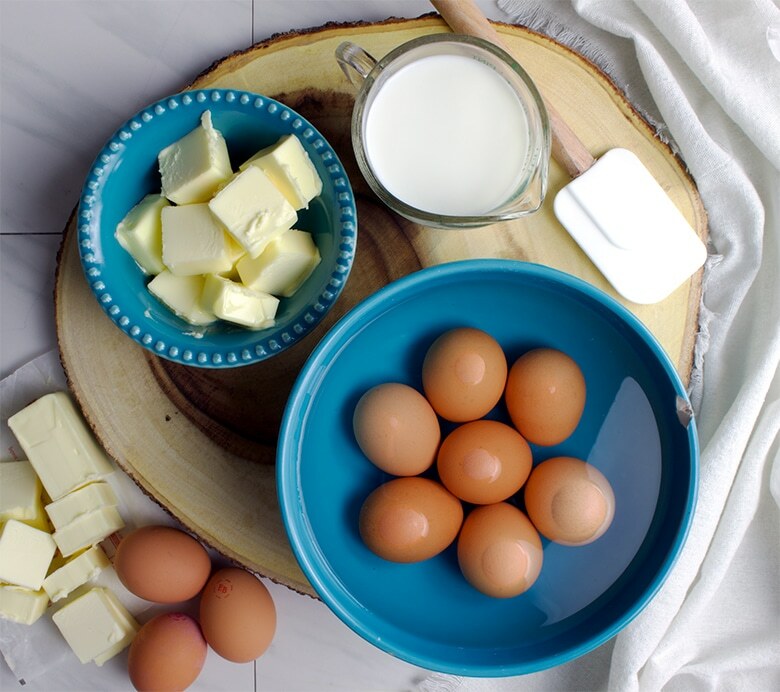 Just as with the eggs, the simplest way to bring butter to room temperature is to let it sit out on the counter for a couple of hours. 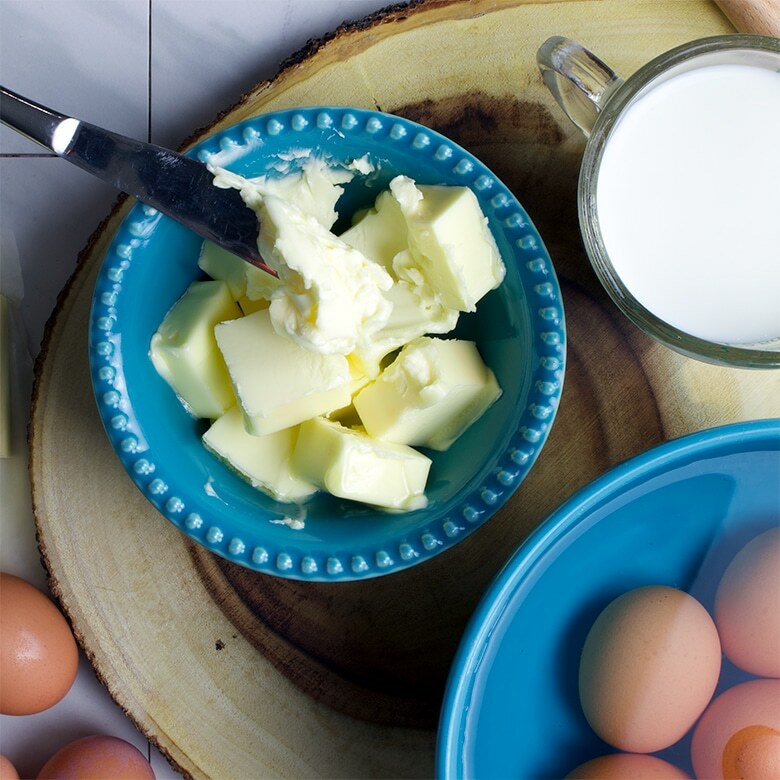 Unlike with eggs, it’s safe to leave butter outside of the refrigerator for quite a while – up to a couple of days. Butter’s high fat and low water content makes it slow to spoil. So, leaving it out on the counter for a day or two (or more) is perfectly safe. Having said that, I almost always store my butter in the refrigerator all the time. For those times when the butter is cold and I want to bake right now, bringing it to room temperature is super easy. Just cut the amount of butter that you need into pieces, plop them into a bowl, and pop the bowl into the microwave. Heat the butter at 50% power for 20 seconds. Press a knife or your finger into the butter to see if it’s soft enough. What’s “soft enough”? You want the butter to be soft enough that you could spread it over a soft roll with ease. If 20 seconds isn’t long enough to achieve that consistency, pop it back in, heating it in 10 second intervals until it is. 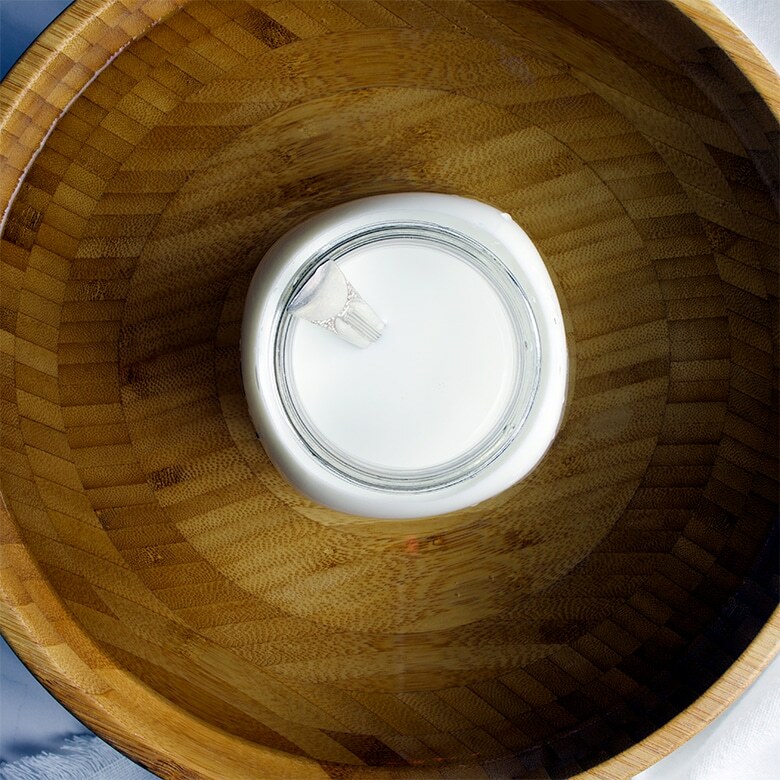 How to bring milk, cream, half-and-half and buttermilk to room temperature. Like eggs, milk should not be left out of the refrigerator for longer than two hours. To bring it to room temperature quickly and safely, pour it into a microwave safe dish or measuring cup and heat it in the microwave for a few seconds: 20 seconds for 1/2 cup of milk, 30 seconds for 1 cup of milk, 45 seconds for 2 cups of milk. Stir the milk – microwaves do not heat liquid evenly, then put your finger in the milk to feel the temperature. If it feels colder than room temperature, continue to heat it in short 10 second bursts, stirring and feeling the temperature after each session. Follow the same pattern for half-and-half and cream. Buttermilk is a different story. When you heat buttermilk, it separates. This is how ricotta cheese is made. Microwaves, even when heating food at partial power, tend to heat liquid unevenly. This can result in parts of the buttermilk getting warm enough to separate. To bring it to room temperature without much separation (a bit is ok), use a similar technique as with eggs – heat it in a warm water bath. Pour the buttermilk into a tall glass or jar and set it in a bowl that’s been filled with warm water. As with eggs, the water should be about the temperature you would want to take a bath in. Let it sit in there for 5-30 minutes (depending on how much buttermilk you are warming), stirring every couple of minutes so that it warms evenly.